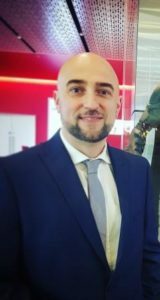 Little did Paul know that when he took up running for his own fitness and wellbeing, that just over one year later he would be running in one of the world’s biggest races; the London Marathon! 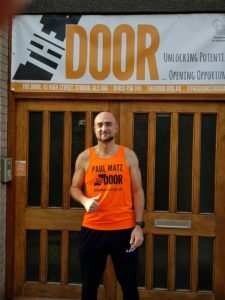 At the end of April I am going to be running the London Marathon and raising money for The Door. With less than a month to go it’s starting to feel very real and I’m can’t decide if I’m getting more excited or terrified! I took up running last year for my own fitness and goals and I ran the Stroud Trail Half Marathon for The Door in May – being able to use my efforts to get fit to benefit others too, was a real privilege. Living in Stroud, I was always aware of the great work The Door do, mentoring especially is something very close to my heart. I feel very blessed to be where I am now, and I know that bad times and struggles can hit anyone even when they least expect it. Since May I have joined Stroud District Athletics Club, and running has become a major and important part of my life. It is so good for my body (I have lost 3.5 stone since I started! ), and my mind – I’m finding running really helpful in dealing with the stresses and issues that life throws at me. I love my group in SDAC, and have performed in a few more events since that May, including a 10k, 10 mile trail, and most recently the Stroud Half Marathon in September, which I managed in 1 hour 43! I had in no way planned to run a full marathon, but when I was given the chance by The Door, I just couldn’t turn it down. It’s such an amazing opportunity and my aim is to finish under 4 hours. I think The Door is very special as it is driven by Christian principles. They actually show God's love in action in a practical way which I think is bang on and I really hope that people will get behind me to support this amazing charity and all it’s hard work. They make a real positive change in people’s lives every day. Help Paul reach his target donate today at thedoor.org.uk/paul or visit The Door Shop to make a cash donation. Preparations have been going well having recently completed my third month of training pretty much to plan, running around 30-35 miles a week. My speed and strength training is also going well and my weekend long runs getting longer! I have a swim day on Wednesdays, this is becoming easier too as I'm learning to breathe more efficiently. 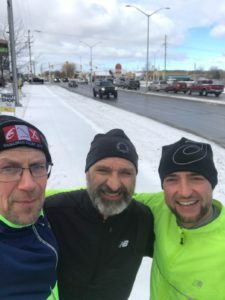 Hitting 20 miles as my longest run ever, the fact that it was in London, Ontario Canada was the icing on the cake! I had a fabulous week out there this month and fell in with a group there who were fantastic, I really raised my game running with a couple of guys doing an average pace of 8:38 min miles! Overall I’m still feeling good and pain free on the whole, please Lord may that continue for the next 5 weeks!! You can sponsor Paul today at thedoor.org.uk/paul or visit The Door Shop to make a cash donation.